This set of images popped up on my Google Reader today, and I just have to share them. Click on the highlighted link to Vulgare, a blog on landscape issues, and take a look at the remarkable Chapel Oak in France. Then take a look at Leaves from the Notebook of a Tamed Optimist,, to see images of other tree-chapels. Thanks for your comment on Vulgare. I will make a link about it on Vulgare, shortly. 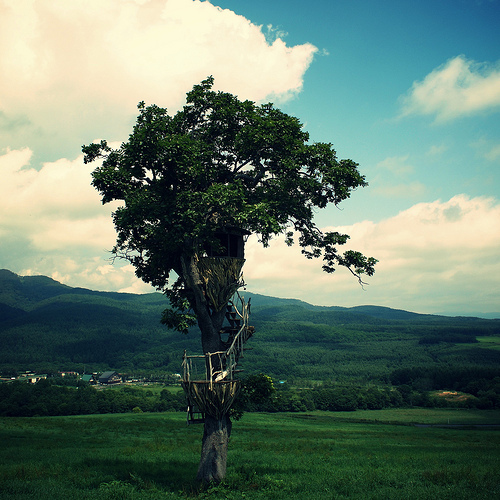 A friend of mine, Taka Kobayashi, of Japan is the builder of the tree house in your picture. Here is a link to some more about Taka!